You know you’ve done it: one day you’re driving around, minding your own business, and you realize your “Check Engine” light is on. But since you don’t hear any noises, see smoke, and your tire hasn’t fallen off you pretty much ignore it. Right? This isn’t uncommon. Most drivers react to a car problem when it actually becomes a problem. But the Check Engine light is there for a reason. Car MD tracks car repair reports and has compiled what they call a Vehicle Health Index. 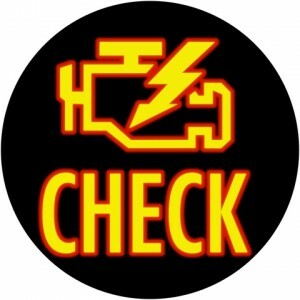 One of the things they track is the dreaded Check Engine light and they’ve broken down the most common causes. 9.34% : Replace O2 Sensor-the O2 sensor monitors the unburned oxygen in your exhaust and if the problem isn’t resolved it can lead to as much as a 40% reduction in gas mileage. 9.28%: Loose Fuel Cap-this is the problem to have, simply tighten or replace your gas cap and you should be good to go. 6.40%: Replace Catalytic Converter-this is one of those “you shoulda fixed it when you had the chance” repairs. A catalytic converter goes bad because you didn’t replace a faulty spark plug so pay attention to the small fixes before they get big. 4.36%: Replace Mass Air Flow Sensor-this can really hit you at the pump. The mass air flow sensor calculates the air coming into your car and determines how much fuel to spray into the engine. A faulty one can reduce your mileage up to 25%. 3.71%: Replace Spark Plugs/Wires-the little fix that saves you big. The spark plug ignites your car’s air/fuel ratio and if they fail will not only reduce gas mileage but do a real number on your catalytic converter (we just talked about that) and cost you big bucks. So as much as you’d like to ignore that little cartoon engine that glows in the dark, it’s probably a good idea to take your car to the shop to have it evaluated. At Sallas Auto Repair our goal is to keep your car going as long as possible. It’s no secret we’re holding onto our cars longer so avoid those costly repairs down the road by giving your car a little TLC when it says it needs it. We can help you maintain your car with some routine adjustments and keep that light from bugging you.